Today Mr. Bajaj, though not widely known outside the district, is arguably the most successful restaurateur in Washington. And his trajectory over the last 25 years mirrors that of a city that has gone from a paragon of urban dysfunction to a wellspring of prosperity. Ashok’s empire stretches beyond authentic and delicious Indian fare served at The Bombay Club, Rasika, and Rasika West End, to also include 701 Restaurant, Aredeo + Bardeo, Bibiana, Oval Room, and the newly opened NoPA Kitchen + Bar. Sure, having a lot of restaurants under your belt may not mean much, but on any given night every single one of them is packed, and on any given night, each and every night, the quality and consistency of the food served at all of them are top notch. I love Indian food, and for me, it doesn’t get much better than lunch at the posh and polished Bombay Club, where the service is only outshined by the food. This “K Street Classic” is tucked between the White House and Treasury, the US Chamber of Commerce, the luxurious Hay Adams Hotel, and dozens of lobbying and law firms. When you walk in you’re greeted by off-white linens with perfectly placed settings, and what seems like a ratio of 10 servers, wait staff, runners, and more for every guest. It truly is an experience and thankfully the food matches the ambiance. 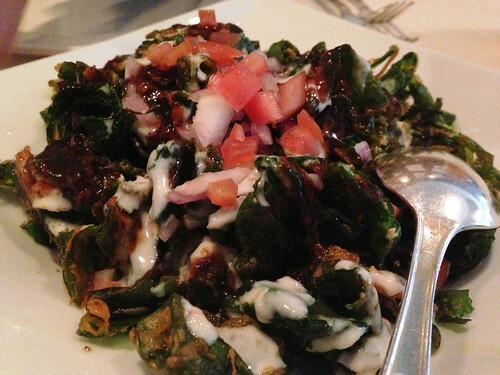 To start, whether at Bombay or either Rasika, the Crispy Arugula-Spinach Chat is amazing. 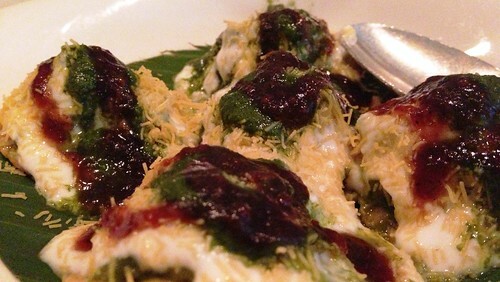 Think of light and fluffy crispy fried spinach and arugula with onions and diced tomatoes on top and a sweet date-tamarind chutney. It is one of my top 10 dishes period in Washington, DC. Just try and save some for you dining companions. Next, you should also start with the Bhalla Papri Chaat. These are a traditional Delhi street food. They are essentially like Indian nachos if you will. A “chip” of sorts holds a lentil dumpling topped with sauces, yogurt and cheese. These are packed with flavor, perfect for sharing with a group, or just yourself. Whatever, no judgement here. Ok, onto the main courses. 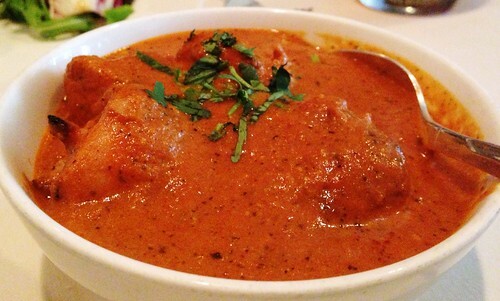 If you are new to Indian cuisine, I’d suggest two classics: lamb vindaloo and chicken tikka. Both are traditional staples on any Indian restaurant menu, however to have truly wonderful vindaloo will transport you to another dimension. Ashok’s vindaloo is spicy, but not hot. Hints of tangy vinegar cut the rich sauce, while the lingering notes of cinnamon and cardamom aromatically swirl around your tongue. The potatoes, onions, and tender pieces of lamb are each cooked to perfection. 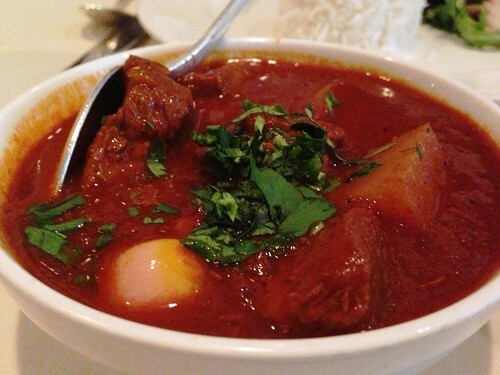 Lamb vindaloo is my favorite dish and The Bombay Club has the best I have had. The chicken tikka is just as delicious. A tad milder than the vindaloo, and the sauce is lighter in color, so less rich – but don’t mistake that as packing any less flavor. Want to write for HungryLobbyist.com?